I've been anticipating and humble-bragging that I would soon reach 300 Tridion blog posts. But I had to double check and the truth is since joining the Tridion online community, I've already posted 311 posts, but not all have been about Tridion. 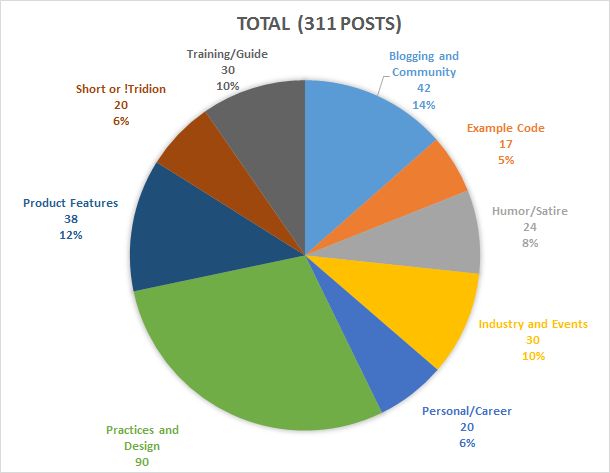 See a breakdown of my posts since 2011* across my personal blog, the official community site (previously TridionWorld and now SDL Community), and TridionDeveloper, a blog hosted by ContentBloom. *I'm not including the cookbook, PowerTools, or my BA Toolkit code as posts. And though I started blogging and Tridion a few years before 2011, I didn't have the nerve to blog about Tridion until 2011. I'm sure posts could be reclassified or might have multiple categories, but I'm keeping it mostly simple. I posted on a variety of topics on my own blog. But on sites with a clearer audience, I posted on fewer topics, meant for the intended audience. 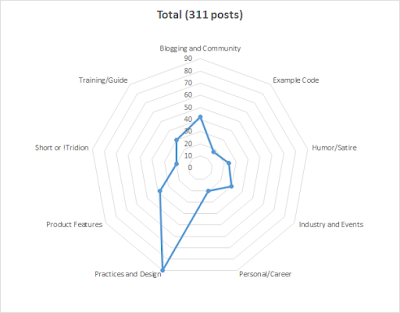 For TridionDeveloper I had a few technical posts on practices or design as well as example code. I also announced the Tridion Stack Exchange beta. 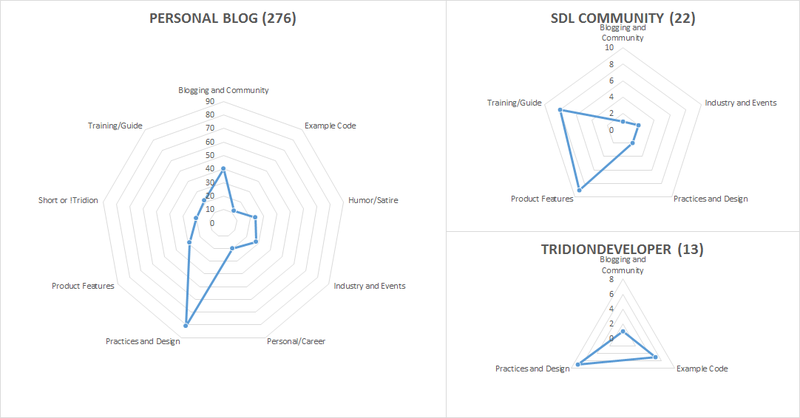 On SDL Community or TridionWorld I shared training information or guides, product features, and a few posts on practices, industry events (Innovate), and community. Combined, these made up my past 311 posts. Share whatever you want, as long as its appropriate for the audience. 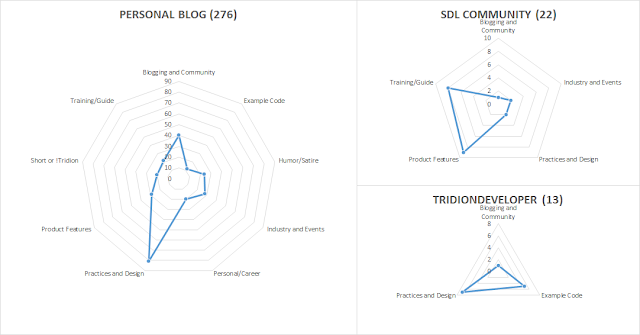 Below you can see I kept humorous, personal, or non-Tridion posts off both the official SDL Community sites and TridionDeveloper blog. But topics were "fair game" on CreateAndBreak.net. "...there’s nothing like meeting someone physically for the first time after having 'known' that person for a while online – and then sharing a beer!" In addition to the Tridion-specific topics, I've shared some personal or career updates as well as some humorous posts, where I think I managed to piss someone off once, but promptly apologized and corrected the offending bits. That's a lot of blah blah blogging. And since I had the data already (in Excel), I took another view with radial diagrams to emphasize the focus for each of these channels. My personal blog, CreateAndBreak.net, features lots of topics, with the majority about Tridion practices and design. 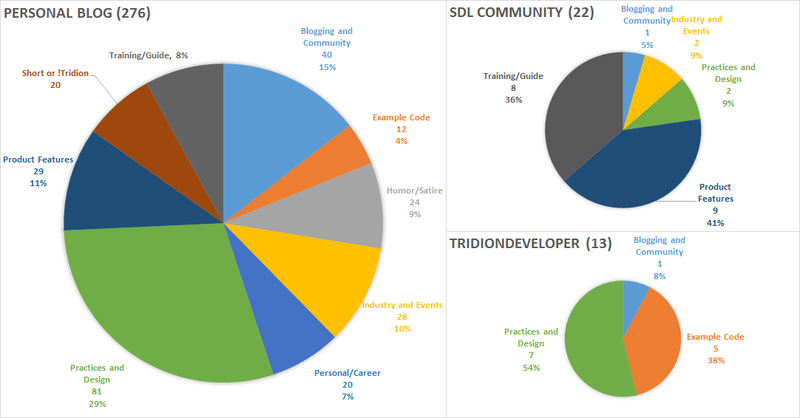 However, SDL Community/TridionWorld as well as TridionDeveloper are more about the audience. 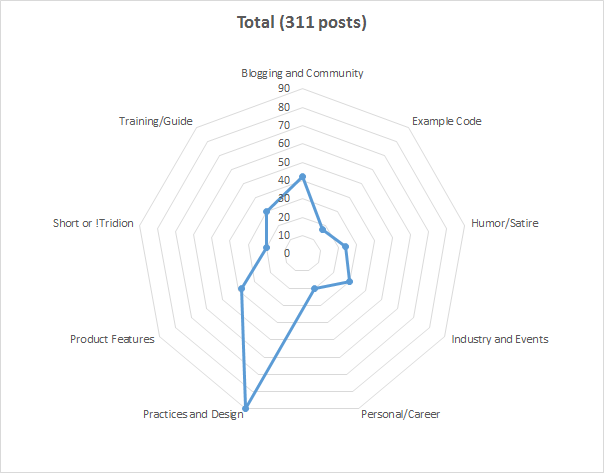 I'm trying not to see a baby seal in this profile of blog topics. 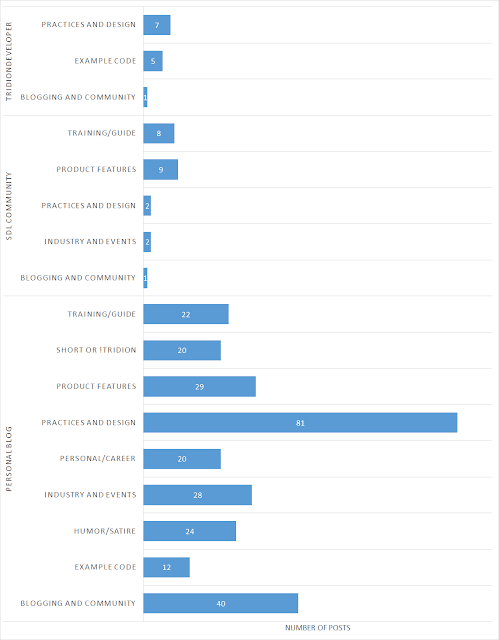 So though it's true that I've long advocated blogging and shared about the Tridion community itself, the majority (~29% or 81 posts, give or take) of my posts have been about Tridion practices and design. I somehow managed to share about a dozen snippets of code as well. I suspect my posting velocity will drop a bit in my current role, but I'll continue to share about product features, industry news, and observations about our excellent community and developers. Thanks so much for all of your help and community contributions along the way. Keep sharing and let us know about your own milestones.